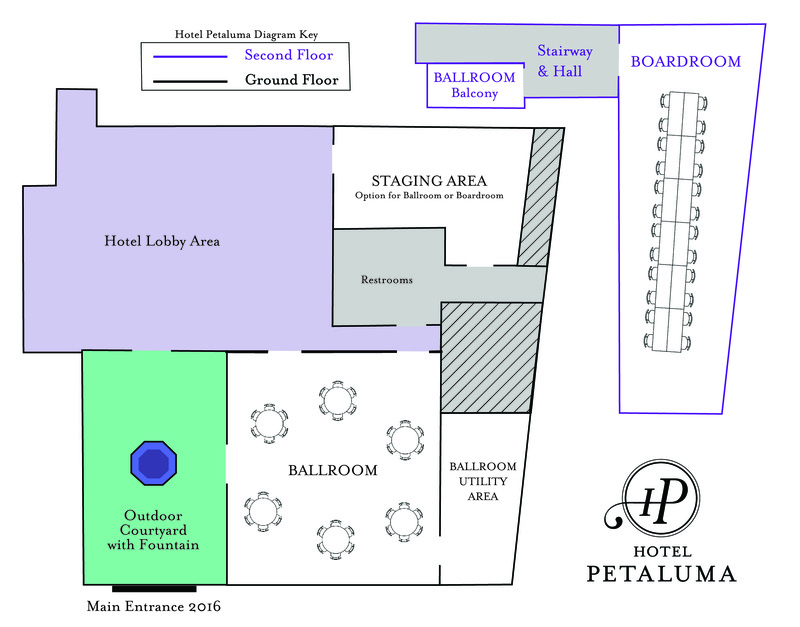 Spacenotes: Hotel Petaluma features a beautiful 1900-square-foot ballroom and a 950-square-foot boardroom. Both rooms feature fully restored hardwood floors and windows, and period architectural detail. The hotel lobby features a wine bar and fireplace lounge, the perfect spot for unwinding or making new connections. Event rentals always include room setup, tables with tablecloths, and chairs with chair covers. Catering, A/V, and other event services are currently provided by an esteemed group of preferred professionals. We will gladly assist in the coordination of all desired services for your event and refer you to our favorite caterers, event planners, and other event specialists based on your specific needs.